Safety pins in the esophagus // Buttons in the stomach // Sewing needles in the bronchi // All extracted and kept by one curious doctor. A pair of molar roots, the brass foot of an alarm clock, buffalo nickels and Mercury dimes, a half-dollar dated 1892. A crucifix with several rosary beads still attached; the metallic letter Z from a toy airplane; a handful of pebbles formed from hardened pus. Safety pins, each splayed open, an alphabet of angles; bones, some slender as a lock of hair. A poker chip, a coffee berry (unroasted), a Perfect Attendance pin. Each object found its unhappy place in a person’s trachea, larynx, bronchus, esophagus, stomach, pleural cavity, lung tissue, pharynx or tonsil. Each was removed—and kept—by a laryngologist with the improbable name of Chevalier Quixote Jackson. 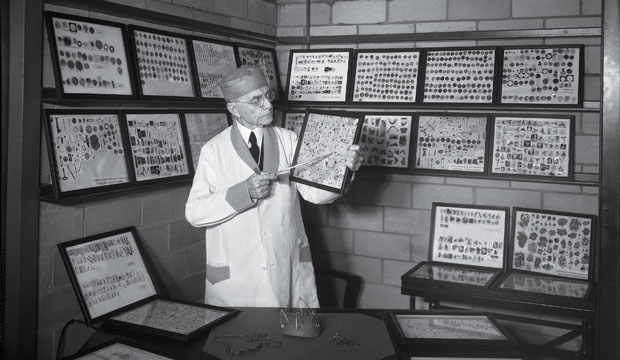 The physician, who worked in Pittsburgh, then Philadelphia, during the late nineteenth and early twentieth centuries, was rarely paid by his patients; his only request was that he be allowed to keep what he called the “fbdy,” short for “foreign body.” His collection of more than 2,000 objects, which he donated to Philadelphia’s Mütter Museum in the early 1920s—and is perhaps overshadowed by the museum’s more grotesque medical oddities—is undergoing a complete refurbishment, the first phase of which debuted in February. So determined was Jackson to keep every fbdy that when an angry father threatened to kill “that Doctor Jackson who stole my quarter,” which his son had swallowed, Jackson, by the physician’s own recollection, subdued the man with a gentle voice and refused. Though the boy suffered a broken arm and a bloody lip at his father’s hands for not recovering the coin, Jackson stood firm, offering the family a half-dollar instead. Yet Jackson should be as much remembered for his pioneering work as for his obsessive collecting. He went at each bit of peanut kernel stuck in a trachea, each safety pin (which he enjoyed calling “danger pins”) in a stomach, as a newly challenging Gordian knot, each solution carefully described in the hundreds of books and articles he wrote during his 93 years. Before Jackson, only two patients out of a hundred might successfully cough up, regurgitate or excrete a foreign body, and surgery resulted in death in 98% of all cases. His construction of the bronchoscope in 1899 (it was not the first, but it came to be considered one of the best) was a major advance. Jackson developed thousands of instruments and saved as many lives; his students went on to save half a million more. Both in his fbdy collection and in his paintings, perhaps we might glimpse the same beauty he saw. Mary Cappello is the author of Swallow: Foreign Bodies, Their Ingestion, Inspiration, and the Curious Doctor Who Extracted Them, from which this essay is adapted. Copyright © 2010 by Mary Cappello. Reprinted here with permission of the New Press. Cappello is a 2011 Guggenheim Fellow in Nonfiction. To view Proto's Chevalier Quixote Jackson gallery, click here. From safety pins to sewing needles, Chevalier Quixote Jackson extracted numerous odd items from his patients.